Background: Malaria is a public health problem in Ethiopia, where more than 60% of the population lives in risky areas. Since 2005, malaria-related sicknesses and deaths have substantially decreased in the country, mainly due to the increasing coverage of vector control interventions and chemotherapy. On the other hand, resistance to most public health insecticides is widely spreading among the populations of the principal malaria vector Anopheles arabiensis. Therefore, assessing the susceptibility status of local malaria vectors is an essential activity to improve the effectiveness of the interventions, by introducing the appropriate insecticide resistance management strategies. There are also substantial gaps in knowledge regarding the entomological inoculation rate (EIR), which is an indicator of the intensity of malaria transmission, and are used to assess the impact of vector control interventions. Understanding the species composition, feeding and resting behaviours, parity rate, as well as human biting and sporozoite rates, are all important in evaluating the effectiveness of interventions and planning for supplementary vector control tools. Moreover, improving housing, such as screen doors and windows, and closing openings on walls and eaves, might reduce the entry of malaria vectors and provide protection from infectious bites of malaria vectors. Objective: The study was carried out to help assess the species composition, age structure, feeding patterns, sporozoite infection rate, entomological inoculation rate and insecticide susceptibility status of An. arabiensis, and evaluate the impact of screened houses on its indoor density. Methods: The study was done in the Chano Mille Kebele in southwestern Ethiopia. The longitudinal entomological study was conducted from May 2009-April 2010, whereas the house screening intervention was done between April-November 2011. Thirty houses (10 houses for each collection method) were randomly selected for biweekly Anopheles mosquito sampling. The Anopheles mosquitoes were collected by the Centers for Disease Control and Prevention (CDC) light traps, pyrethrum spray catches (PSC) and from artificial pit shelters by aspirating. Enzyme-linked-immunosorbent assay (ELISA) was used to analyse the blood meal origins and circumsporozoite proteins. The EIR of P. falciparum and P. vivax of An. arabiensis was calculated by multiplying the sporozoite and human biting rates from CDC light traps and PSC collections. A randomized control trial was conducted to assess the impact of screening windows and doors with wire mesh, and closing openings on eaves and walls by mud on the indoor density of An. arabiensis. Baseline mosquito data was gathered biweekly from 40 houses by CDC light traps in March and April 2011 to randomize houses into both control and intervention groups. The windows and doors of 20 houses were screened by mosquito-proof wire mesh, and openings on the walls and eaves were closed by mud. The rest of the 20 houses were assigned to the control group. Mosquitoes were collected biweekly in October and November 2011 from both the control and intervention houses. Results: Anopheles species, comprised of An. arabiensis, An. marshalli, An. garnhami, An. funestus group, An. pharoensis, An. tenebrosus, An. rhodensiensis, An. flavicosta, An. longipalpis, An. daniculicus, An. pretoriensis, An. chrysti, An. moucheti, An. distinctus and An. zeimanni, were documented in the area. Anopheles arabiensis was by far the most dominant species. The overall human blood index (HBI) of An. arabiensis, including the mixed blood meals, was 44%, whereas the bovine blood index (BBI), including mixed blood meals, was 69%. The majority of An. arabiensis (65%) from the indoor-resting collection had bovine blood meal, which was unexpected. The higher proportion (75%) of indoor host-seeking An. arabiensis collected by CDC light traps had contact with humans. Only 13% An. arabiensis from pit shelters had human blood meal, while 68% had bovine blood meal. Anopheles arabiensis showed a consistently higher feeding pattern on cattle than on humans, regardless of collection sites and the high number of the human population. The human and bovine feeding patterns of An. arabiensis showed little change due to the number of cattle to human ratio of each household. Anopheles marshalli and An. garnhami showed similar feeding patterns. Anopheles arabiensis was highly resistant to four pyrethroid insecticides tested (lambdacyhalothrin, cyfluthrin, alphacypermethrin and deltamethrin) and DDT, with a maximum mortality rate of 56% due to lambdacyhalothrin and a minimum of 10% due to DDT. The circumsporozoite protein ELISA test revealed 11 P. falciparum infections out of 14 sporozoite positive An. arabiensis (the other three were P. vivax), thereby confirming that this species is the principal vector of P. falciparum and P. vivax parasites. The P. falciparum sporozoite rate of An. arabiensis was 0.32% for CDC light traps, 0.28% for pit shelters and 0.23% for PSCs. The overall estimated annual P. falciparum EIR of An. arabiensis from CDC light traps was 17.1 infectious bites/person/year (ib/p/y), but it varied between houses, from a 0 EIR in 60% of houses to 73.2 in a house close to the major breeding site. Hence, those houses nearest to the mosquito breeding sites had a higher risk of exposure to infectious bites. The P. falciparum EIR of An. arabiensis was 2.4 in the dry season and 14.7 in the wet season, indicating 6.1-fold more infectious bites in the wet- than in the dry season. The P. falciparum and P. vivax EIR of An. arabiensis from PSC was 0.1ib/p/y, while the P. vivax EIR of An. arabiensis from CDC light traps was 2.41ib/p/y. The screening of doors and windows with wire mesh, and closing the openings on eaves and walls by mud, significantly reduced the indoor density of host-seeking An. arabiensis by 40%. The intervention was cheap, and can be incorporated into malaria vector control programmes by local communities. Conclusion: Anopheles arabiensis showed a consistently higher feeding pattern on cattle than on humans regardless of collection sites and the high number of human population. It was the most abundant and the principal vector of P. falciparum and P. vivax, while An. marshalli and An. garnhami were the second and third most abundant species, but neither of them was positive for CSPs. The transmission of malaria is heterogeneous; those houses nearest to the mosquito breeding sites (hot spots) had a higher risk of exposure to the infectious bites of An. arabiensis. Anopheles arabiensis was resistant to pyrethroid insecticides, the only class of insecticides recommended for LLINs treatment; as a result, there should be an action programme to manage insecticide resistance. Finally, supplementary methods of vector control, such as the screening of houses, could be included to help improve malaria control in the area based on the principle of integrated vector management. 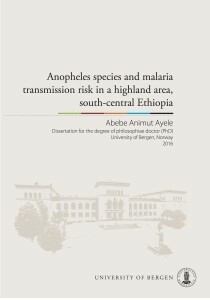 Anopheles arabiensis is the primary malaria vector in the lowlands of Ethiopia. In the highland Butajira area, a typical area of highland Ethiopia, the entomological aspects of the disease remain poorly described. The study describes the entomological aspects of malaria transmission by highlighting on the abundance, host feeding preferences, entomological inoculation rates (EIRs) and risk of households’ exposure to malaria infectious Anopheles bites over two years. The study was done at three different altitudes ranging from 1800 to 2300 m.
Ten species of larval stages and nine species of adult stages of anophelines occurred in the area. The streams were the main breeding habitats of the anophelines. Anopheles arabiensis was the most prevalent species, and was found to feed on human and cattle with a similar preference. Plasmodium falciparum and Plasmodium vivax infected Anopheles arabiensis and Plasmodium vivax infected Anopheles pharoensis were caught in the low- and mid-altitude villages. Also, houses with open eaves had higher density of malaria infectious Anopheles arabiensis. Abebe Animut Ayele was born in 1968 in Gojjam in Ethiopia. 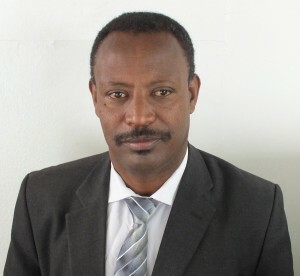 He completed his bachelor’s degree in biology and his master’s degree in medical parasitology from Addis Ababa University where he works as a lecturer. He started his PhD training at the Centre for International Health, University of Bergen in 2008 with Professor Bernt Lindtjørn as main supervisor and Associate Professor Teshome Gebre-Michael as co-supervisor. Animut A, Gebre-Michael T, Balkew M, Lindtjorn B. Abundance and dynamics of anopheline larvae in a highland malarious area of south-central Ethiopia. Parasit Vectors. 2012;5:117. Animut A, Balkew M, Gebre-Michael T, Lindtjorn B. Blood meal sources and entomological inoculation rates of anophelines along a highland altitudinal transect in south-central Ethiopia. Malar J 2013; 12(1): 76. Animut A, Balkew M, Lindtjorn B. Impact of housing condition on indoor-biting and indoor-resting Anopheles arabiensis density in a highland area, central Ethiopia. 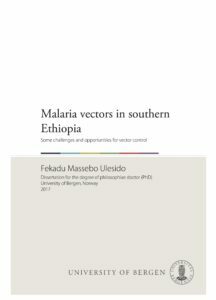 Malaria journal 2013;12(1):393. Massebo F, Balkew M, Gebre-Michael T, Lindtjorn B. Zoophagic behaviour of anopheline mosquitoes in southwest Ethiopia: opportunity for malaria vector control. Parasites & vectors 2015; 8(1): 645. Lindtjorn B, Loha E, Deressa W, Balkew M, Gebremichael T, Sorteberg A, Woyessa A, Animut A, Diriba K, Massebo F, et al: Strengthening malaria and climate research in Ethiopia. Malaria Journal 2014, 13:P56. The project “Ethiopian Malaria Prediction System” implemented from 2007 to 2012 combined new population-based malaria transmission information with climate and land use variability data to develop an early warning tool to predict malaria epidemics in Ethiopia. Scientists from Ethiopia and Norway collaborated to incorporate climate variability and forecast information for malaria epidemics. Our study shows that the association between weather and malaria is complex. Statistical models can predict malaria for large areas. However, as malaria transmission varies and depends on local environmental conditions, we need to have good and local knowledge about each area. However, weather variability is the main driver of malaria in Ethiopia. While the generation of precipitation depends on local ascent and cooling of the air, our research provided new data on the transport of moisture into the country that may improve weather forecasting. 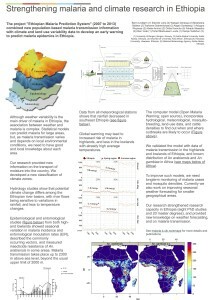 We developed a new classification of climate zones, have mapped drought episodes in Ethiopia during the last decades, and have improved seasonal weather forecasting. 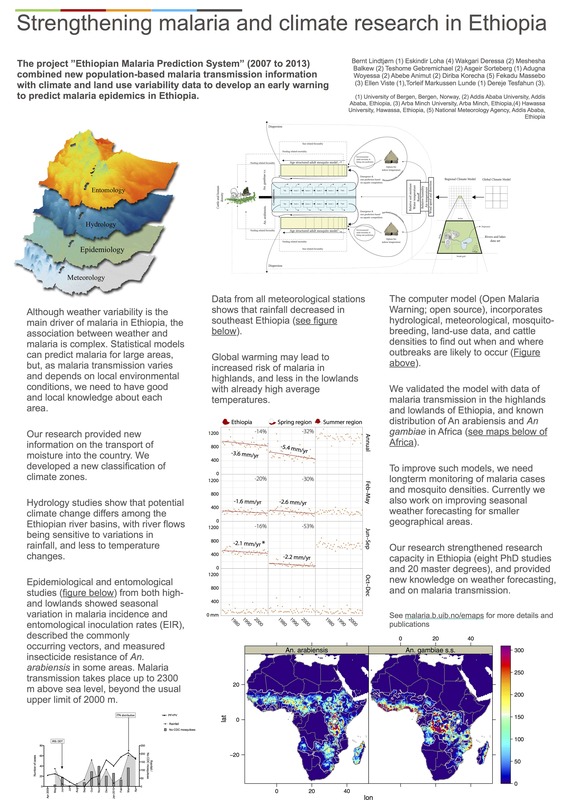 Our hydrology studies show that potential climate change differs among the Ethiopian river basins, with river flows being sensitive to variations in rainfall, and less to temperature changes. The computer model, Open Malaria Warning, incorporates hydrological, meteorological, mosquito-breeding, land-use data, and cattle densities to find out when and where outbreaks are likely to occur. We validated the model with data for malaria transmission in the highlands and lowlands, characterizing malaria transmission over some years in both highlands and lowlands. This provided us with new knowledge on malaria transmission in Ethiopia, how intense the seasonal transmission is, and how malaria occurs in different populations and areas. Our study showed that indigenous malaria transmission during a non-epidemic year takes place above 2000 m altitude. We also showed the ideal temperature for malaria transmission is about 25°C, underlining that global warming may lead to increased risk of malaria in highland areas, and less in the lowlands with already high average temperatures. However, to validate such models, there is a need for several years of active monitoring of malaria cases and mosquito densities. Unfortunately, such data is rare in Africa, and we need to invest in long-term monitoring of malaria transmission.